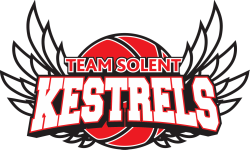 Kestrels Div 3 Mens Coach and Solent Universtity BUCS Head Coach Sylvain Donneaud’s launches new appeal after his daughter Zoe was diagnosed with DIPG (Diffuse Intrinsic Pontine Glioma) an aggressive brain tumour. Only 10% of children diagnosed with DIPG survive for two years, and less than 1% survive for more than five years, with the median survival time being nine months. His family set up a Facebook donations page 'Association Princesse Zoé atteinte de DIPG' (Princesses Zoe Association) in September and since then £11,000 has been donated. Click HERE for the page. The fund will help with treatment and travel for Zoe. Sylvain and his wife, Emilie, have of course not given up hope for Zoe. Special T-Shirts have been available at Kestrels games this season and will continue to be available for purchase at £10.